Indian Poets have time and again affected Indian society, culture and tradition through their magnificent contribution to Indian Poetry in English. Among them, there is a prominent poet Kamala Das who has also beautifully portrayed social and cultural colors of Indian life and societyin her poetry during the early twentieth century. Her poems ‘The Old Playhouse’ and ‘Composition’ reflect the same through the contrast of her past life with her presentleading to the conclusion that most of the times women are exploited or mistreated and, therefore, suffer in the traditional Indian society.She recollects her childhood at her grandmother’s house in Malabar, the ancestral heritage and the shocks of the death of her grandmother along with her shifts in different cities because of her father’s job and her unsuccessful and traumatic married life as per the norms and values of Indian society. Thus, she highlights the most sensitive issues of custom-ridden society of India and also sets some significant examples of hope for the betterment of the society in its own ways. Keywords: Indianness,Indian theme, subjugation, nostalgia, abjection. The research paper is an attempt to study Indianness in two poems- ‘The Old Playhouse’ (Das 1-2) and ‘Composition’(Das 3-10) of Kamala Das, who is the most read and widely known Indian poetess of post-colonial era. The word ‘Indianness’, which suggests the totality of culture, food, religion, ideas as a whole, is defined by Professor V.K.Gokak as ‘An Indian, is a person who owns up the entire Indian heritage and not merely a portion of it. This cultural awareness is an indispensable feature of Indianness’ (Gokak 24). Kamala Das was born in 1934 at Punnayurkulum, the Southern part of Malabar. She is known for her collection which includesSummer in Calcutta (1965), The Descendants (1967) and TheOld Playhouse and Other Poems (1973), Tonight, This Savage Rite (1979), Collected Poems (1984), Only the Soul Knows How to Sing (1996), Closure (2009). Kamala Das’s noted poems‘The Old Playhouse’ and ‘Composition’occur in herthird poetic collection The Old Playhouse and Other Poems published in 1973. In these poems Das presents a contrast of her past with her present. Her past reappears when she recollects her childhood at her grandmother’s house in Malabar. With the death of her grandmother and herunsuccessful married life she started longing for her old days in Malabar with her grandmother, her ancestral household and her shifts in different cities because of her father’s job. The poem ‘The Old Playhouse’ reveals the memories in her mind of her loving grandmother. The word ‘Playhouse’ signifies the poet’s mind in which thoughts and memories play their part in the darkness surrounded all over. Her grandmother’s love was unconditional towards her and she connects it with innocence and purity. The poet wants to go back home once in her life to bring back her peace of mind. Her grandmother was the only source of protection, security and love for her. In this poem Das inculcates a comparison her own self with a swallow or a bird and her husband with a captor who wants to control her of memories of the past. All her desires for love and affection came to an end when she discovered that she has married a self-centered man who has no care for her emotions and afflictions. Pathways of the sky (Das 1). The hollowness of her adult life is always overshadowed by the innocence of her childhood. There is a possible contrast between the village life and the city life in many of her poems. Her grandmother is in her inner mind some kind of a complex which gives her the strength to face the realities of life (Bruce 147). She is trapped in her married life and wants freedom to express herself. In the beginning of the poem she has used the word ‘You’ to address her husband who wants to take away her freedom, memories left within her. She dislikes the way he treats her and began to develop hatred towards him. She became a dwarf left only with household responsibilities on her shoulders totally disheartened and abandoned from the rest of the world. Her happy days were restricted to suffering and humiliation with no freedom of her own. Her treatment of images is further shown by using the words vitamins, artificial lights, air-conditioner, and flowers in the vases to show her domestic monotonous duties in order to adjust in her relationship bond. Her mind therefore, has become an old playhouse without any light of her own. As much as you want(Das4). Das again shows herself as a victim caught in the web of tribulation. According to her the meaning of ‘growth’ for a woman is the growth from a girl to a wife, then to a mother who has to search for her identity, security, shelter and love throughout her life. She was never afraid of death as depicted in all her poems. Her beautiful vision of life with a peaceful house, loving husband surrounded with happiness, care and understanding was shattered as she grows up. Her portrayal about life became a tragedy for her from whom she wants freedom and escape. She later, found herself as a social misfit everywhere left with hopelessness and misery. Her use of words, idioms and mainly symbolism contribute to what is termed as Indianization of English. In this poem ‘Composition’, ‘red house’ represents the love for the ancient grandmother’s house and by dismantling it the poet has lost the old tradition that has grown around it. Similarly, words like ‘haunted, tottering roof, crumble, scattered, fragments’(Das 1-10) all signifies the memories that has grown old deep down inside. According to Kamala Das the subjugation of women is due to the dependence on male folk. Despite of being honest and pure at heart, women are exploited, victimized in one way or the other. In both of these poems she has made an attempt to represent her thoughts of freedom in contrast with the Indian culture which became all the more challenging for her. Her longing for freedom was characteristic feature of her Nair ethos where she only gets the warmth of love and affection from her ideal grandmother. The concept of equality in Indian context was an unfamiliar idea and something contradictory against Indian social laws. Her poetic verses became an epitome of writing spontaneous and uninhibited poetry. Thus, Kamala Das expresses her feelings and emotions in typical Indian style; ‘that is the spirit in which her poems over conceived and written and that is how they work, engaging, conversational…’ (Kohli 1xxii). Her Indianness is at its best in her poems where she talks about the basic issues of her family history and the issues of common man. Being an Indian her poems depicts her as an outsider representing her own city along with her picturesque use of idioms, vocabulary, images of men and women centering on emotions and style of expressions. Her rich symbolic pattern of language expressing Indianness makes her a major poet of Indian poetry in English. Das, Kamala. The Old Playhouse and Other Poems. New Delhi: Orient BlackSwan, 2014. Print. Gokak, V. K. The Concept of Indianness with reference to Indian Writing in English. Ramesh Mohan(ed.). Madras: Orient Longman, 1978. Print. King, Bruce. Modern Indian Poetry in English. Delhi: Oxford University Press, 1987. Print. Iyengar, K.R.S. Indian Writings in English. New Delhi: Sterling Publishers Private Limited, 2013. Print. Kaur, Tejinder. Perspective on Kamala Das’s Prose. New Delhi: Intellectual Publishing House, 1980. Print. Kohli, Devindra. Kamala Das Selected Poems. Delhi: Penguin Books, 2014. Print. 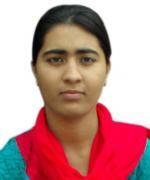 Mansha Ashraf is a Ph.D Research Scholar at SRM University, Sonipat, Haryana. She resides at H.No.161, Umar Colony, Baghati-Kanipora-190014, Jammu & Kashmir and can also be contacted through e-mail: sheikhmansha5@gmail.com.